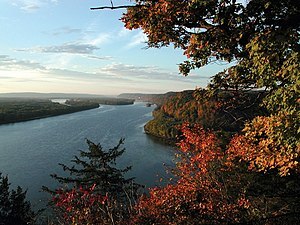 Name oreegin: Ojibwe wird misi-ziibi, meanin "Great River", or gichi-ziibi, meanin "Big River"
The Mississippi River is the chief river o the lairgest drainage seestem on the North American continent. ↑ Kammerer, J.C. (May 1990). "Largest Rivers in the United States". U.S. Geological Survey. Retrieved February 22, 2011. ↑ "Lengths of the major rivers". United States Geological Survey. Retrieved March 14, 2009. This page wis last eeditit on 3 Mairch 2018, at 23:46.